The Stony Brook University Alumni Association held a memorial ceremony on the Academic Mall on Tuesday, Sept. 11, to honor the members of the Stony Brook community who were killed in the 2001 9/11 attacks. The event was held to promote the “most basic ideals of freedom and equality,” as explained by the invitation sent to the entire campus community via campus announcements. The ceremony began at 8:46 a.m. with the tolling of the campus bell 21 times, inviting students, faculty and staff to partake in a moment of silence. That time was chosen to mark the precise moment 17 years ago when the first plane flew into the World Trade Center’s North Tower. The 21 bell chimes symbolized the 21 alumni who lost their lives during the attacks. 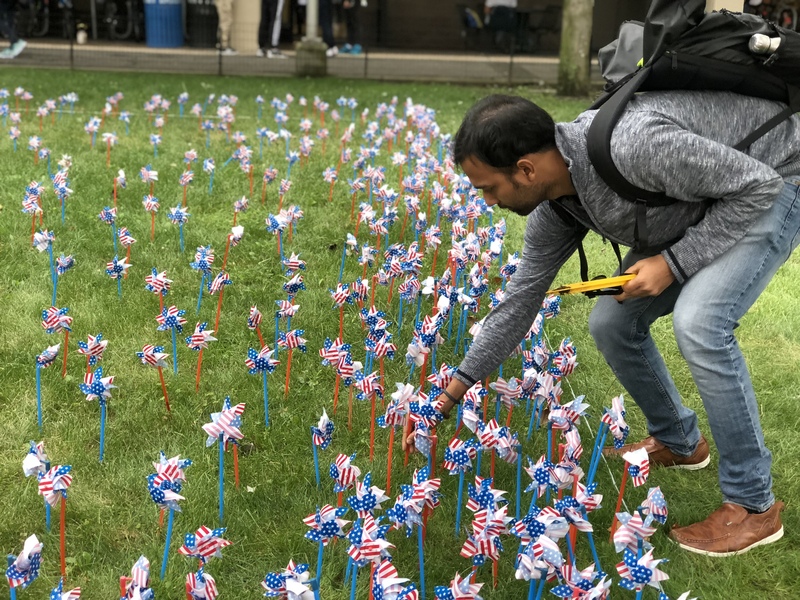 The Alumni Association handed out pinwheels with American flag print for passersby to plant in the small grassy patch between the Frank Melville Jr. Memorial Library and the Student Activities Center. Associate Director of Alumni Relations, Janet Masini, explained that the ceremony has changed over the years from a formal event to a simple pinwheel garden, which was introduced five years ago. Junior political science major and president of the Stony Brook College Democrats, Cecelia Masselli, was one of the many people who stopped to pay her respects. Though many students were too young to remember that day in detail, for journalism assistant professor Karen Masterson — who was working as a journalist in Washington D.C. at the time — 9/11 is still fresh in her memory. Over 400 pinwheels were planted according to volunteers from the Alumni Association. By the end of the event at 2:30 p.m., the patch on the Academic Mall was almost filled with flag-printed pinwheels.